What you may not know is that you are probably investing in guns. That’s right, those of us who are saving for retirement or our kids’ college likely have gun stocks (which are highly lucrative) in our portfolios. 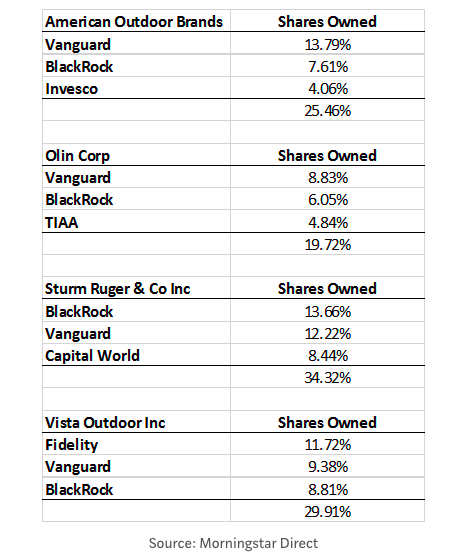 That’s because, as the chart below shows, some of the largest investors own considerable shares in these gun companies. While it’s not always easy to divest from guns, all-of-us must stop fueling mass shootings. Visit goodbyegunstocks to see whether your investment portfolio includes gun stocks. Share goodbyegunstocks with your financial advisor or person at your place of employment who is responsible for managing your retirement benefits. Ask them how you can change your portfolio to remove gun stocks. Talk to them about socially responsible “ESG” investment funds, which are growing rapidly and don’t include investments in guns. Share goodbyegunstocks on social media so that we can shine a light on the funds that support guns.